On an unknown date in the latter half of 782, Charlemagne did some seriously nasty business with a captured army of Saxons. In the late 8th century, the King of the Franks was fighting a decades-long running campaign against Saxon tribes at the edge of his sprawling European empire. One part Christianizing the pagans and two (or more) parts territorial aggrandizement, Charlemagne’s exertions on the Rhinish frontier were opposed by Widukind, or Witikind, or Widochind, whose “forest-child” name belies its owner’s legendary ferocity. In the summer of 782, when Charlemagne perhaps thought he had whatever passed for peace among the querulous Saxons, Widukind raised a revolt and dealt the Franks a stinging defeat that put a couple of imperial legates into the ground and made some martyrs out of clerics he found in the wrong place at the time. questioned the primores of the Saxons, all of whom be had summoned to attend him, as to who was responsible for the rebellion which had taken place. And since they all declared that Widukind was the author of this wickedness but were unable to deliver him up in view of the fact that he had taken himself off to the Northmen once the deed had been done, no fewer than 4500 of the others, those who had fallen in with his promptings and committed such a gross outrage, were handed over and at the place on the river Aller called Verden, at the king’s command, all beheaded in a single day. Thus was punishment executed; and the king then retired to winter-quarters at Thionville, where he celebrated both the Lord’s birthday and Easter in the customary fashion. This merciless slaughter of prisoners is one of the lasting blights on Charlemagne’s impressive reputation. Even so, the reputation had the last word: three years later, Witikind was finally defeated and delivered up, in person, to the Frankish ruler … who accepted the Saxon pagan’s submission and forced him to convert to Christianity. 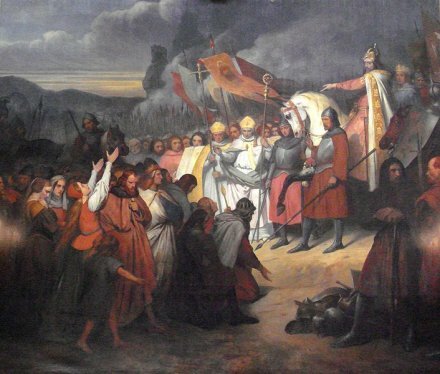 Charlemagne receives Witikind’s submission at Paderborn in 785.